Mixing valve DN15 (1/2"), +35 °C - +65 °C, Kvs 1,5 brass, female thread, LK 551 HydroMix. We don't sell the LK Armatur products to outside of Estonia! 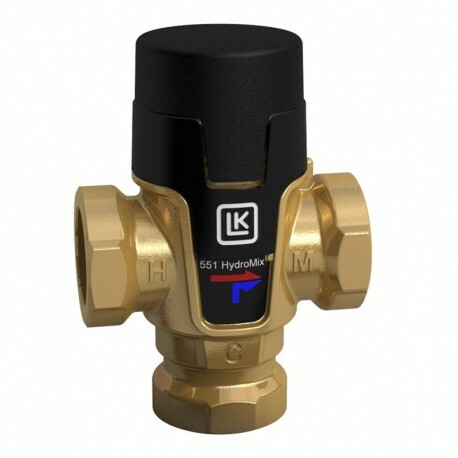 Mixing valve LK 551 HydroMix for water heating systems. The mixing valve has a thermostatic element that regulates the supply of cold as well as hot water in order to achieve the desired temperature. The valve has an anti-scald function that shuts off the incoming hot water flow in case of failure of cold water supply. Arrows on the valve body indicate the direction of the flow. When fitted on top of boiler/storage tanks with built-in water heaters the valve should be installed with some space between boiler/storage tank and valve so as not to let the function of the valve be affected by heat radiation. The valve knob is used to set the desired warm water temperature within the range of 35°C to 55°C/65°C. The protective cap prevents unintentional changes of the temperature setting. The installation must be performed in accordance with applicable installation rules, laws and regulations. Before operating the system, the tap water temperature must be checked to prevent risks of legionella growth and burns. Never dismantle the valve under pressure.